Put away in a collectors smoke free home, this instrument has only been played a few times. MONSTER MONSTER Wide Flame Top on this one! The Custom 24 is the original PRS – the guitar Paul Reed Smith took to his first tradeshow in 1985. A perennial favorite with musicians, this model was significantly updated in 2011. Specially appointed to celebrate the evolution of this hallmark model, the 2011 Tree of Life Custom 24 Limited Edition instruments come in two new colors and are adorned with a redesigned Tree of Life inlay. The original Tree of Life inlay was featured on the 1996 Rosewood Ltd. guitar and was designed with Larry Sifel of Pearl Works, a longtime partner to PRS. This updated version was designed with Jaime Aulson of Pearl Works (who created the outline “J” birds in 2008) and is comprised of Green Abalone (both heart and standard varieties), Donkey Ear Abalone, and Black-Lip Ocean Pearl Oyster, beautifully distinguishing these commemorative instruments. 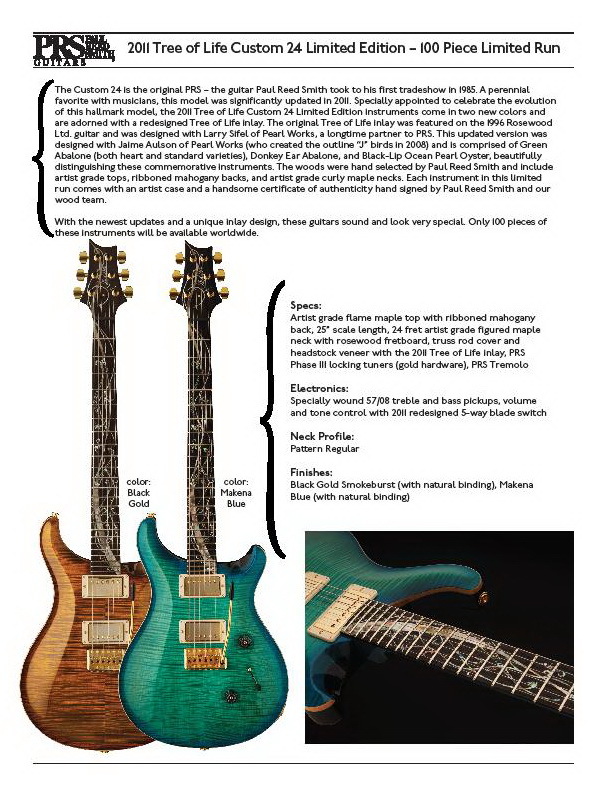 The woods were hand selected by Paul Reed Smith and our wood team and include artist grade tops, ribboned mahogany backs, and artist grade curly maple necks. Each instrument in this limited run comes with an artist case and a handsome certificate of authenticity hand signed by Paul Reed Smith. With the newest updates and a unique inlay design, these guitars sound and look very special. Only 100 pieces (50 of each color) of these celebratory instruments will be available worldwide.